Scentsy Mexico has made several improvements that make it even easier to be a Scentsy Consultant in Mexico and will be sharing those announcements and more at three Scentsy opportunity meetings throughout Mexico. Now is a fantastic time to get on the ground level of Scentsy in Mexico and grow your own business and be your own boss! Every year Scentsy offers an all-expense paid incentive trip so you could earn free trips as well! Join now and you could earn a free trip to the Dominican Republic! Our team is international and full of successful, supportive, and helpful Scentsy Consultants all over the world with training designed to help you achieve your goals. 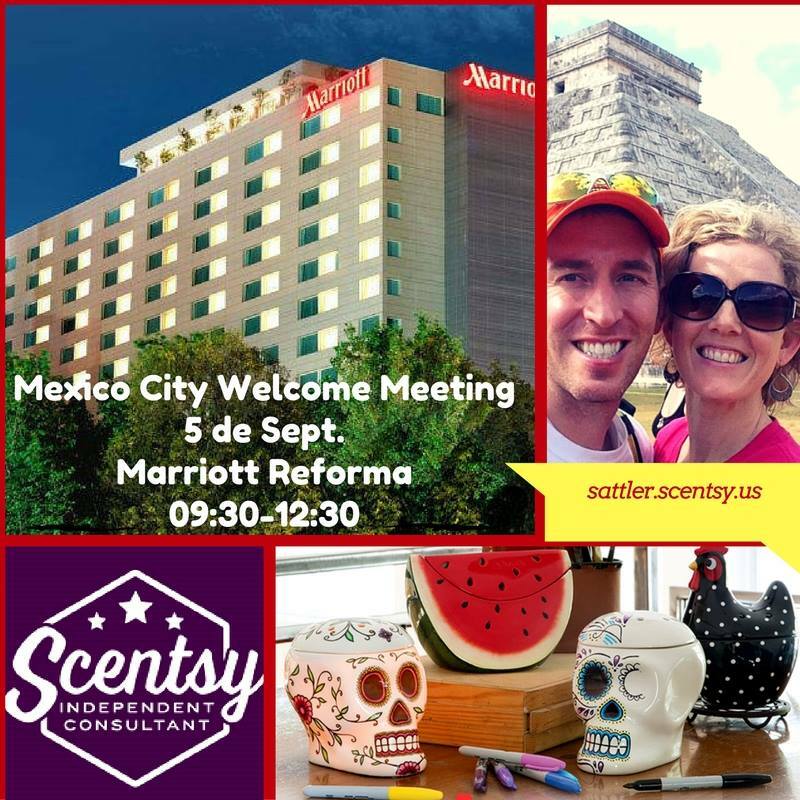 All of the Scentsy Mexico meetings will be held the first week of September. The first meeting will be held in Mexico City, Mexico the 5th of September at the Marriott Reforma. If you live in or around beautiful Mexico City, this is your chance to have all of your questions answered about what it is like to be a Scentsy Consultant in Mexico. Even better, go as a brand new Consultant and follow the link to join my Global Scentsy team! Feel free to call, PM me on facebook or email me to learn more about how to join and get started on your own business! 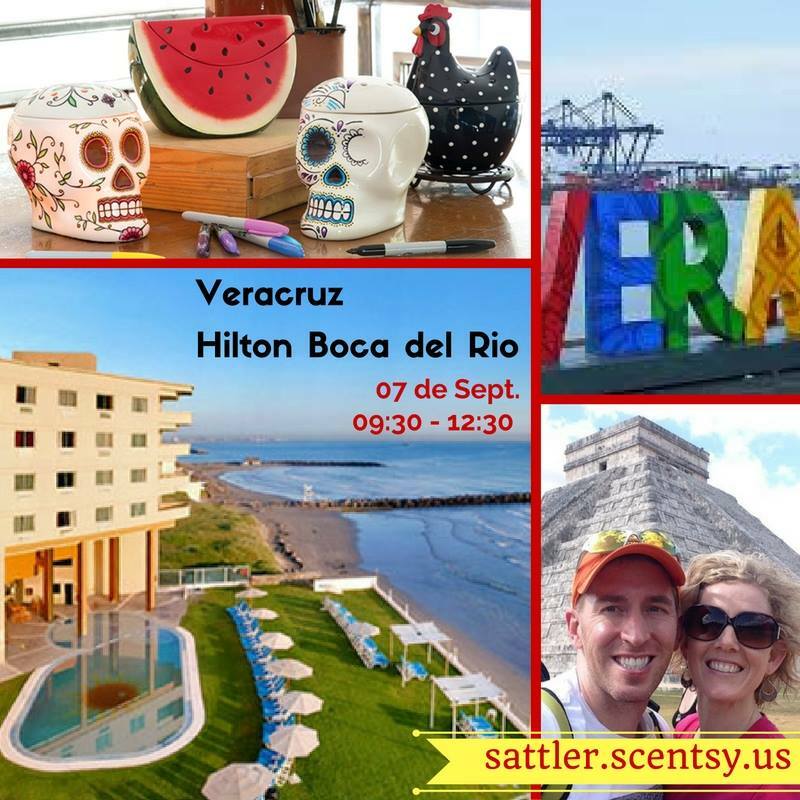 The second Scentsy Mexico meeting will be held 2 days later, the 7th of September in amazing Guadalajara at the Hilton Boca del Rio. If you live in or around Veracruz this meeting will be an amazing opportunity to learn more about Scentsy and how to be successful at your own business. I paid off my startup costs in the first month! Learn about all the new changes to the Scentsy opportunity in Mexico and the expenses paid incentive trip you can earn. 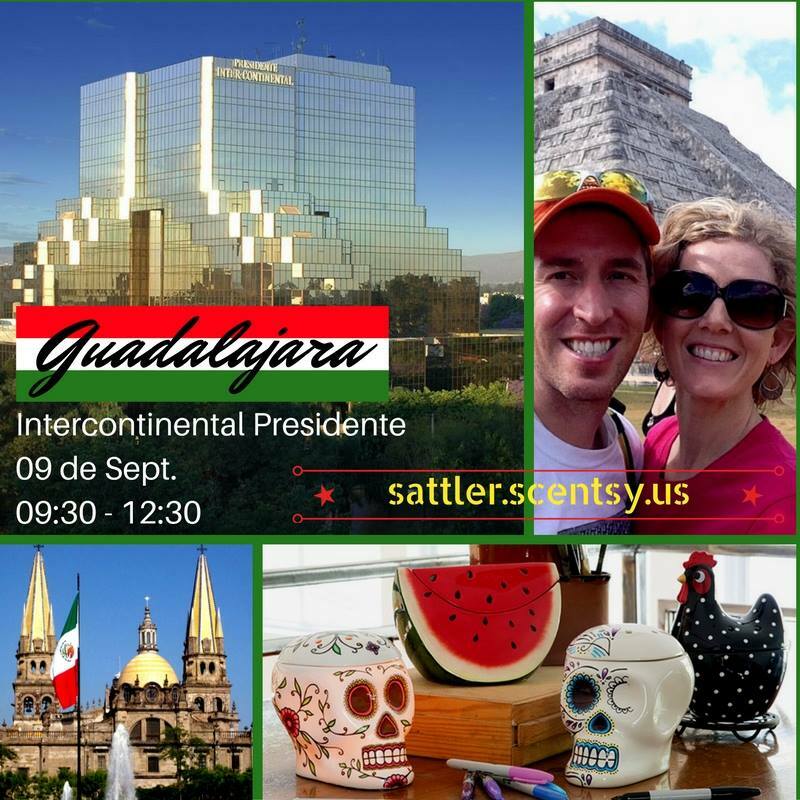 The third and final Scentsy Mexico meeting will be at the Intercontinental President in Guadalajara. If you live in or around Guadalajara, Mexico this meeting will be an amazing opportunity to learn more about Scentsy and how to be successful at your own business. With all the changes Scentsy has made recently to improve the opportunity to make it even better to be a Scentsy Consultant in Mexico, there is no better tim to join than now! Join today and go to the meeting as a brand new Scentsy Consultant! Follow the link to join my Global Scentsy team! Feel free to call, PM me on facebook or email me to learn more about how to join and get started on your own business! How do I become a Scentsy Mexico Consultant? Choosing a good sponsor and mentor is very important; it will be key to helping you build a successful Scentsy business in Mexico. I would love to be your sponsor and mentor to help ensure you have proper training and help. I love being a Scentsy mentor and have earned Scentsy’s prestigious Annual Mentor Award the past four years. I will put in the time and effort to support you in your Scentsy business in Mexico as you are one of the founding Consultants in Mexico! As a Scentsy Mexico Consultant, you will be required to sell 150 PRV every three months. What tools will I have as a Scentsy Mexico Consultant? Each Scentsy Mexico Consultant will receive a Scentsy Fragrance Mexico Starter Kit that will contain business materials, marketing materials, and products so you can successfully launch your business. You will also have my individual mentoring to help you build your Scentsy Mexico business according to your interests, talents, and connections. Each Scentsy Mexico Consultant will also receive a free website for three months. How often do Scentsy Mexico catalogs change? Scentsy catalogs are released twice a year: Fall/Winter catalog in September and Spring/Summer catalog in March. Where do products ship for Scentsy Mexico? All Scentsy products will ship from the Distribution Center in Coppell, Texas. There will be a 10 business day shipping guarantee for products to arrive in Scentsy Mexico. How do I buy Scentsy products in Mexico? You can buy Scentsy in Mexico straight from my Scentsy website. Click on the flag in the upper righthand corner to change to the Mexico flag and find all of the authentic Scentsy products you want! You do not have to attend a party; you can buy Scentsy directly online and it will ship straight to you in Mexico. What shipping costs will be associated with orders in Mexico? *Orders sent directly to a customer instead of to the primary shipping address chosen by the Consultant. The shipping charges listed are VAT inclusive. Shipments are limited within Mexico. How are items taxed in Mexico? Mexico has a Value Added Tax (VAT) of 16 percent. The added tax must be included in the listed price of products. For instance, if a Scentsy Warmer is listed at $43 (AUD), that price is VAT inclusive. Scentsy has a global Compensation Plan designed to support multiple countries. The commission calculation is: PRV x Commission Percentage x Peg Rate = Commission amount in local currency. So excited to announce that September 1, 2013 Scentsy Fragrance will open in Mexico! Contact me for information or to get ready to sign up and be among the first Mexico Scentsy Consultant ever!! If you know someone who might be interested in joining Scentsy in Mexico too, I’d love your referral! More info on selling Scentsy in Mexico and FAQ. The exciting news is that if you live in the United States and Canada, you can recruit and sponsor new team members in Mexico, but you can also sell Scentsy in Mexico if you sign the cross-border agreement. What exciting news! If you live in Mexico and would like to buy Scentsy, I can help! Give me a call or order Scentsy in Mexico online on my website and it will ship to you in Mexico.